In an effort to create a safe living environment for people, the HCM City authorities have decided that waste water treatment systems must be built at all medical stations. Hundreds of billions of dong have been spent to build the systems at 324 yard/commune healthcare stations in the city. Meanwhile, the modern systems have been left unused. What do the waste water treatment systems treat? 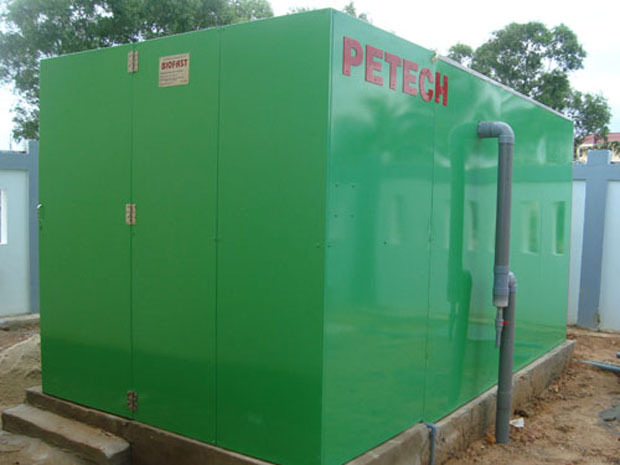 It is estimated that every waste water treatment system at medical stations costs 400-500 million dong. N, a physician in district 10, said the local budget has wasted money on the waste water treatment system, because the system is not necessary here. “Only a few patients come to see us every day to have changes of the dressing or have injections. The medical instruments are gathered and then soaked in disinfecting fluid at the end of every day before they are brought to be dry cleaned. As such, the waste water has no germs, and no need to treat it,” N said. In principle, the activities of dental treatment or ob-gyn treatment would create the waste water that needs treatment. However, very few medical stations at grassroots level have dental doctors, while the medical stations with dental doctors cannot attract patients. People would go to specialized hospitals when they need mental treatment. T, head of a healthcare station in district 11, also said it was a great waste when building waste water treatment systems at medical stations, mostly the community health centers. “There are a lot of hospitals and clinics around here, and very few people come to see us to ask for treatment. The waste discharged from the stations like ours are mostly solid waste, which has been well treated already,” T said. Regarding the investment rate, a doctor said each system costs 400-500 million dong. As such, the 324 heath stations in the city alone have “gobbled up” 150 billion dong of the local budget. The big problem here is that the systems have not been running at full capacity, because they have nothing to treat. Therefore, they have been mostly used to treat running water. Meanwhile, each of the system needs at least 4kwh a day to run, or 120 kwh a month. And the volume of electricity needed to run the systems at 324 health stations is about 39,000 kwh. Dr Le Truong Giang, Chair of the HCM City Community Health Association, former Director of the HCM City Healthcare Station, said in principle, all the waste water from healthcare stations must be treated. However, he said it would be better to make investment in accordance with the priority order, since the local budget is limited. The new regulation that private dental clinics must have waste water treatment system has made dentists worried stiff. A dentist in district 10 said that if her clinic has 5 or 7 dental chairs, she would not be hesitant to spend money to build such a system. Meanwhile, it would cost her too much money if she has to build a system just for the small mental station with only one dental chair. Meanwhile, the local authorities have warned that they would apply drastic measures to ensure the stringent enforcement of the new regulation. The private healthcare centers which do not have treatment systems, would not be granted new practice licenses.